Russian president Vladimir Putin addressed the press at the World Trade Center in Moscow on Dec. 20, 2012. Two days ago I had the rare opportunity to attend Vladimir Putin’s annual press conference. My colleagues at Itar-Tass warned me that the president tries to break his time record every year–and last year’s topped off at a whopping 4.5 hours. This time, I and some 1,300 other journalists were held captive for a marathon five hours! I was impressed by the range of questions, everything from economic policy to human rights to the fishing regulations in a remote region. Representatives came from across the country, and a few from abroad, and each brought their own local concerns to this once-a-year opportunity to interact directly with the man in charge. One topic which came up over and over was the new ban on U.S. adoptions of Russian children. The regulation, which has since passed in the Duma, is seen to be a reaction to the Magnitsky Act–recently passed in the U.S., it bans travel of Russian officials seen to be complicent in human rights abuses and was deeply resented by the Russian government. Whether or not the adoption law was an act of retaliation, it is both a potential disaster for children and families and a sign of weakening relations between the two countries. It is also a stark example of the misunderstanding that pervades U.S.-Russian relations. During the conference, for instance, Putin continued to sight the misguided point that Russian children that are mistreated in the U.S. are not protected by American law enforcement. The law, he said, is meant to protect Russian children, but with Russia’s overflowing orphanages, it seems more likely to harm them. Putin’s answer to these concerns–a promise to incentivize domestic adoption. 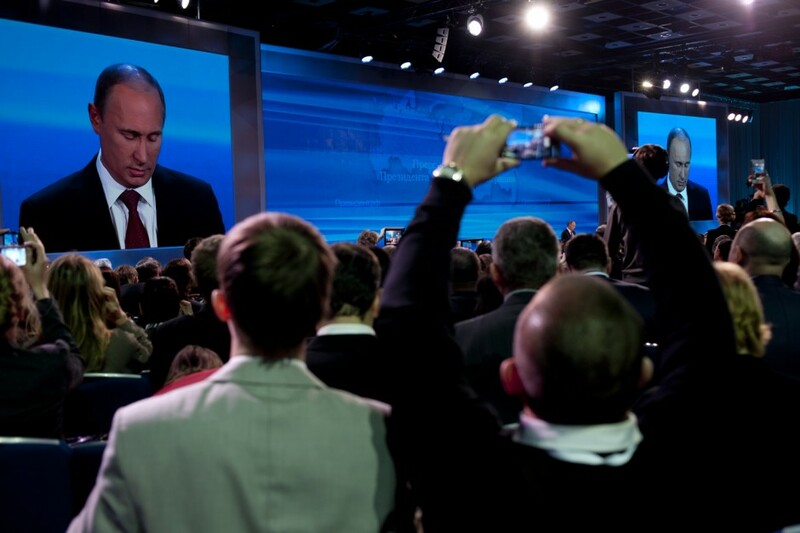 Unlike press events in the U.S., Russian journalists are much more open about their opinions. Several criticized the president directly, openly disagreeing with his policies–including the adoption bill. On the other hand, several praised the president, including a woman who called him strong and handsome. It is a myth that people in this country cannot say what they want, the bigger problem is that saying things doesn’t do much. Most of the journalists in that auditorium on Thursday work for state controlled media. Their papers won’t publish stories that are very critical or in-depth. And even when the independent media does do investigative work, it rarely influences policy or even public opinion. Additionally, journalists who do investigative work put themselves at great risk. One of the most remarkable questions on Thursday came from a journalist who was shot twice in the head because of a story he reported. Putin did make promises to increase investigations in such cases, but even he acknowledged that journalism is a dangerous business. Journalism here is more about spreading information than breaking big news or unveiling scandals. And most often, this information comes from official channels. So it is not as simple as censorship or lack of free speech. We have spent a lot of time on this trip thinking about the role of journalism in Russia and what I have come away with is that it is impossible to try to compare with journalism in the U.S. We have both different governments and different public expectations. These are certainly themes that I will continue to think about when I return to New York tomorrow and I am sure these experiences will help all of us to think more critically about our own work and what role it plays in our cities and states. A note: After reading this, one of our Russian counterparts from the ICFJ program pointed out that state-controlled media, as I said above, is probably not the correct phrase. While I have certainly seen a few examples of media outlets that are very influenced by the government here, it is more appropriate to say that many publications are limited by their dependence on state funding. The ways I have seen this manifest range widely and as with everything else here, it is a nuanced and complicated issue. This entry was posted on Saturday, December 22nd, 2012 at 6:48 am. It is filed under Blog and tagged with Foreign Relations, Moscow, Press Freedom, Putin, Russia. You can follow any responses to this entry through the RSS 2.0 feed.